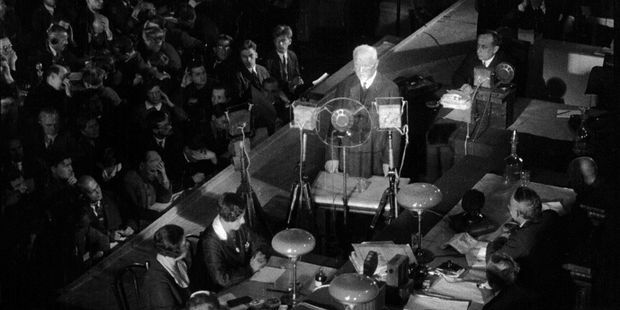 The Trial, a film by Sergei Loznitsa about a 1930 show trial in Stanlist Russia, is a demanding and highly political piece of filmmaking, and is a centrepiece in the Wavelengths program at this year’s TIFF. Wavelengths has featured a particularly strong lineup of documentaries in both 2017 and 2018. Sergei Loznitsa’s new film The Trial is comprised entirely of archival footage of a show trial in Stalinist Russia and the street demonstrations surrounding it. The Ukrainian filmmaker has taken long days of testimony and statements from the 1930 trial and edited them down to two hours. The eight defendants, most of them engineering professors and economists, confess to masterminding a grand scheme to sabotage Soviet industry with foreign help right up to the level of the French prime minister. Occasionally, the members of the so-called Industrial Party plead a naive misunderstanding of the political climate, implicate others before themselves or allow a double entendre to pass their lips: “Apparently I deserve it,” one says of prospective punishment. But mainly they express self-flagellating contrition of a kind that may gladden fanatic hearts, but that is actually an unlikely human reaction to true guilt. The trial is a piece of theatre in which the defendants are playing their scripted roles: Neither the Industrial Party nor its sabotage plot existed and the defendants were guilty of nothing more than doing their best to aid the Soviet Union’s disastrously mismanaged economy. How convenient for a regime if all of a country’s problems could be laid at the door of conniving elites intent on hoodwinking the people. The Trial is a demanding and highly political piece of filmmaking; it’s a centrepiece in the Wavelengths program at this year’s Toronto International Film Festival, and a marker of how that offering of experimental film is increasingly dominated by documentary work. Once a program mainly providing niche audiences with the kind of films you would be more likely to see at the art museum than the rep house, Wavelengths has featured a particularly strong lineup of documentaries in both 2017 and 2018. “It speaks to the moment we are living in,” said Andréa Picard, who programs Wavelengths for TIFF, noting both the rise of the documentary form and the amount of political content in visual art. “There is a convergence between the art world and the doc world,” she added, saying documentarians sometimes find they can access funding through museums and art festivals. Of course, Wavelengths still has art-museum film on offer: One of the shortest films in this year’s program is mumok kino, Philipp Fleischmann’s minute-long examination of architectural space and light inside the Viennese museum of modern art’s cinematheque. And yes, there are important works of fiction: the longest film in the lineup is Mariano Llinas’s 14-hour La Flora; a grand exploration of popular cinema’s many genres from the telenovela to the B-movie, it is a 10-year dramatic project during which its stars aged on screen. But the second-longest film in Wavelengths is Dead Souls, an eight-hour documentary interviewing survivors of Maoist indoctrination camps. 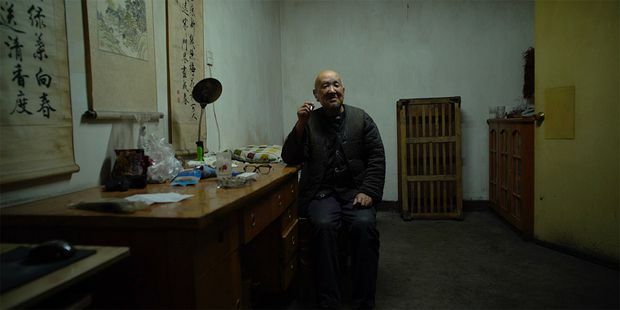 Created by the Chinese filmmaker Wang Bing, it is a good example of the way experimental approaches have infiltrated the documentary world – or how experimental filmmakers have turned to documentary approaches. Because of their length, Wang’s films defy conventional commercial norms – his 2003 film about industrialization, Tie Xi Qu, was more than nine hours – and have been welcomed at visual-arts events such as the German festival Documenta, while the documentarian has also moved into photography and video art. Still, if Dead Souls’s length may place it outside the art-house norm, Wang deploys an absolutely classic use of documentary film as a social witness. In the late 1950s, Chinese authorities rounded up alleged “rightists” and sent them to indoctrination camps in the Gobi Desert. At these prison farms, they were given tiny rations or expected to grow their own food. Many of them starved to death. Wang started interviewing survivors when he was researching The Ditch, his 2010 fictional feature about the camps, and has now turned the interviews into a crucial archival project so that the gross abuse of human rights is not forgotten as aging survivors die. In calm and even friendly tones, the survivors, mainly men in their 80s, tell horrific tales of deprivation. Dead Souls, which clocks in at eight hours, is the second-longest film in the Wavelengths program. The film, in which survivors of Maoist indoctrination camps are interviewed, is a good example of the way experimental approaches have infiltrated the documentary world – or how experimental filmmakers have turned to documentary approaches. Because Mao had declared that bad actors were a minority – only 5 per cent in any group, he estimated – officials set a strict quota on “rightists” targeted for re-education. If they could only find four likely candidates in a work unit of 100 people, they threw in another at random. One of the survivors here was perceived as a threat to an incompetent boss; another dared to question the state monopoly on grain, pointing out that while many Chinese peasants were also starving, the government bought food, but never sold it. The idiocy of the quota on dissidents, such as the fabrication of the Industrial Party in The Trial, is a telling example of how authoritarian governments begin to dictate their own reality. In Wavelengths, Dead Souls acts as something of a bookend to The Trial, the two films standing not only as rebukes to the past but also as highly topical warnings against the gross abuses that flow from authoritarianism. In between the two, The Stone Speakers is a film that moves in much subtler political territory as Bosnian-Canadian documentarian Igor Drljaca investigates the rise of nationalistic tourism in post-Communist, postwar Bosnia and Herzegovina. Is there anything particularly dangerous about the archeological hoax known as the Bosnia pyramids? The natural phenomenon of pyramid-shaped hills is being exploited by a local entrepreneur who makes wild claims about their ancient properties to attract new-age spiritualists. Drljaca also visits Medjugorje, where a charismatic Catholic cult has grown up around a site where local children supposedly conversed with the Virgin Mary – in the dying days of communism. And he films at Visegrad, where the controversial nationalist author and Nobel laureate Ivo Andric is celebrated with an arts centre built in the styles of the historic periods of his novels. The political questions hover, but Drljaca’s approach is observational, letting locals speak for themselves about the attraction of these sites while his camera emphasizes their picturesque nature. For anyone who thought Wavelengths might have forgotten that art is also about beauty, The Stone Speakers is a sweet tonic, too.